Parking lots serve their practical purpose, providing a safe place to park your car away from the flow of traffic on the streets. Well, ideally, a parking lot is a safe place to park and walk away from your vehicle, but poorly-lit parking lots struggle with this. Without adequate lighting to illuminate the entire perimeter of the lot, this can invite car thieves and other wrongdoers to break into your vehicle. Who wants their vehicle broken into when they’re paying to park somewhere in town? Obviously, no one wants that. Fortunately, LED parking lot lights can help increase the security of parking lots in a number of ways. In the past few decades, both interior and exterior lighting has been transformed and revolutionized by light emitting diode (LED) technology. Here at New Edison Lights, we’re on the forefront of the LED lighting wave, providing trusted residential and commercial LED lighting solutions in Longmont, Fort Collins, Estes Park and the greater Front Range of Colorado. With our lighting audit and outdoor LED light installation services, we can work with your business or residence to help you save money on energy costs. Does that sound like a good deal? We’re excited to work with you! Learn more about what we do here. 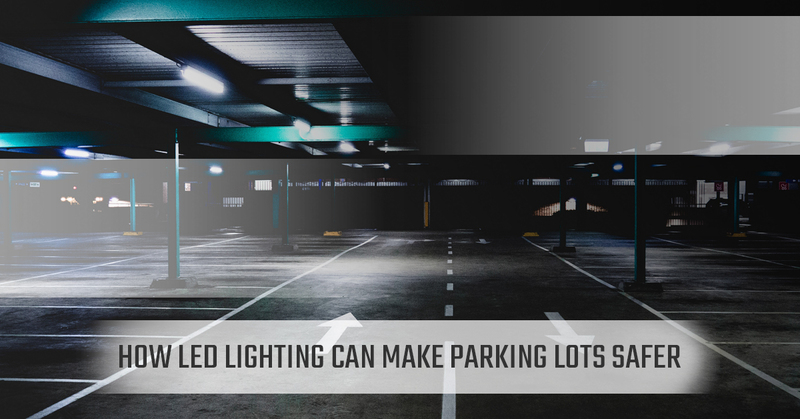 In the interest of making parking lots safer, let’s take a look at some of the things that outdoor LED parking lot lights can do. Have you ever walked out to your car at night in a dimly lit parking lot? It’s no fun. Many people find themselves glancing over their shoulders every couple of seconds, or end up walking a little bit faster than usual. Well, according to researchers at Rensselaer Polytechnic Institute, there’s some science behind feeling unsafe in dark places – people perceive dark, glaring, uneven or otherwise poorly lit parking lots as less safe. So, what that means is that your parking lot lighting could be scaring customers away, compromising your building’s security and even doing measurable damage to your business’ bottom line. By having a well-lit parking lot with the help of an outdoor LED light installation, people are more likely to feel safe and patronize your business. Unless you have high-quality night vision cameras, most security cameras are pretty useless if the area they’re filming isn’t well-lit. Indeed, to pick up images properly, security cameras need uniform lighting. Typically, most security cameras are rated for very low and very high light levels but don’t perform very well with high contrast ranges. Proper lighting design is crucial to making sure that your security cameras perform their best. Having a parking lot that is dimly lit could and often does lead to unnecessary injury. By improving the performance of your lighting with LED technology from New Edison Lights, you’ll be able to mitigate this risk. For the very best in commercial LED lighting in Fort Collins, Longmont and the greater Denver area, choose New Edison Lights to improve your business with new LED lights! Contact us today.